In the early morning hours of January 9, 1965 a small avalanche descended from Johnson Peak across the Hope-Princeton Hwy, a few kilometers from Hope, BC. Four people had stopped to wait for crews to clear the slide from the highway. 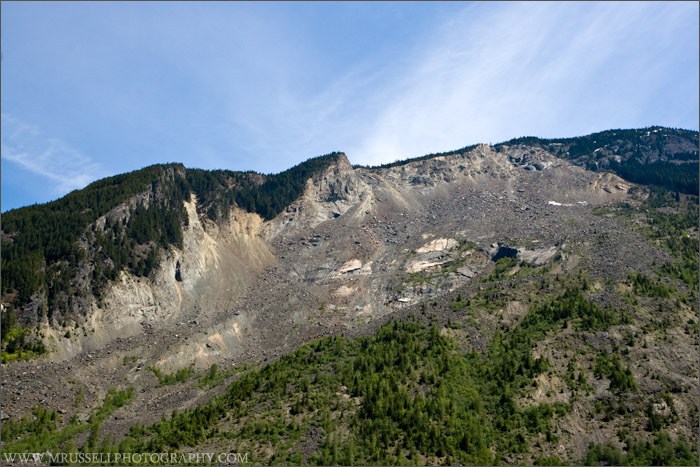 As they waited in the dark, a small earthquake occurred beneath Johnson Peak causing the largest rock avalanche ever recorded in British Columbia. 47 million cubic meters of rock came down the slope, covered the highway, and obliterated Outram Lake. The water from the lake, and some of the rock debris, crossed the valley and flowed from side to side, sloshing back and forth across the valley. Two of the bodies of the 4 people were recovered, the other two are still underneath approximately 70 meters of rock. The highway was rerouted around the slide debris, and a rest stop and memorial overlook the slide area. The first stop on my trip earlier this month through Manning Park/Kelowna/Kamloops was to the Hope Slide.